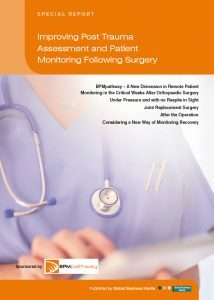 The Report includes an article about BPMpathway entitled, ‘BPMpathway – A New Dimension in Remote Patient Monitoring in the Critical Weeks After Orthopaedic Surgery’, which describes how, with BPMpathway medical-grade technology, orthopaedic patients are being discharged as early as the day of their surgery, with clinicians continuing to monitor remotely their recovery on a daily basis. About the author: John Hancock has been a journalist for nearly 30 years and has written and edited articles, papers and books on a range of medical, management and technology topics. Subjects have included management of long-term conditions, elective and non-elective surgery, Schizophrenia, health risks of travel, local health management and NHS management and reforms – including recent changes and the fall-out from them.